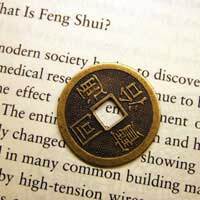 Many people around the world practice a belief called Feng Shui (pronounced fung shway). The words literally mean “wind” (Feng) and “water” (Shui). It is the ancient Chinese practice of arranging and placing things in your home, work, or another dwelling in such a way to achieve a harmonious oneness with the environment. This belief system is a mixture of several areas including geography, religion, philosophy, mathematics, aesthetics and astrology. Feng Shui is used to promote prosperity, good health, and an overall well-being by examining how chi (pronounced chee) flows through a particular dwelling or area. Chi is the energy that connects people and the environment in which they live. It is everywhere – in nature, in the atmosphere, in us - and is in a constant state of flux. The goal of Feng Shui is to make sure that chi flows well and is not blocked, so it does not form an imbalance of energy. Such an imbalance may make you feel ill or depressed. The practice of Feng Shui is believed to have been developed during the Han Dynasty (206 BC – 219 BC). Ancient Feng Shui masters (also spiritual masters) studied nature, the elements, the qualities of yin and yang, the seasons, the quality of land, building materials – all sorts of areas to determine how to maximise the energy or chi that proper Feng Shui can bring about. Select a square or rectangular lot. Select a home with a view of water. The front door should be easily accessible from the street; however, the pathway to your door should not be a straight line. Build only one front door – no double doors. Don’t create rock gardens or plant any obstructions near the entryway. Avoid homes near cemeteries and schools. Both can drain your chi. Avoid purchasing a house in which a tree blocks the front door. This blocks chi from flowing into the home. Don’t have cactuses as houseplants. They give off sharp jagged energy. Your dining table should be rounded rather than square with sharp corners. Keep your home clutter free and clean. Avoid overstuffing your cabinets in the kitchen. It can restrict the energy flow. Hang up some wind chimes – they are said to bring prosperity and luck to a home. Have waterfalls and fountains in and out of your home to create a new energy flow. Also, flowing water equates flowing money. You can try some of these basic Feng shui tips to get started. If you are interested in learning further more about Feng shui, there are many good books on the topic. In larger cities, you may even be able to hire Feng shui expects who will come into your home and do all the work for you!